Neutopia (ニュートピア, Nyūtopia) is a TurboGrafx-16/PC Engine action-adventure game by Hudson Soft. It received a sequel, Neutopia II. 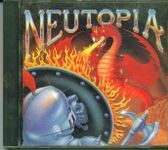 Neutopia was released on the Wii's Virtual Console service on May 1, 2007 in Japan, on August 20, 2007 in the United States and on August 24, 2007 in Europe. The game was released on the PlayStation Network on June 16, 2010 in Japan. Neutopia is an action-adventure game played from an overhead perspective. As the player wanders between contiguous land areas they encounter oceans/lakes, mountains, bridges, merchants, and people just offering advice. The protagonist fends off wandering monsters primarily with a sword, shield and fire wand, blows up obstacles with bombs, and consumes potions to replenish health. Health upgrades can be achieved by defeating Dirth's minions in the eight labyrinths and by finding certain people, while stronger swords and armor can be obtained inside the secret rooms of the labyrinths. The game borrows many elements from Nintendo's The Legend of Zelda series. A wizard named Dirth kidnaps a princess and conquers the land of Neutopia. The player plays as a boy named Jazeta. In order to stop Dirth, Jazeta must collect eight Medallions that are located in eight labyrinths. Jazeta collects the eight Medallions, defeats Dirth, and saves the princess. Source: Wikipedia, "Neutopia", available under the CC-BY-SA License.